November 9, 1918. 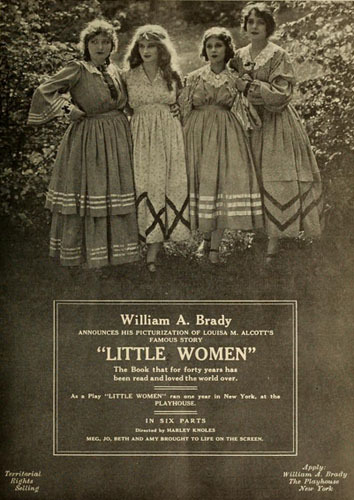 William A. Brady announces the completion of his picturization of “Little Women” and the bringing to life on the screen of four of the most famous characters in American literature — the four little women — Meg, Jo, Beth and Amy. For forty years Louisa M. Alcott’s famous story has been read and loved the world over. “Little Women” has been translated into more languages than the works Of Dickens, and its appeal continues as strong to-day as it was when first published. “Little Women” was filmed in and about the actual house in Concord, occupied by the Alcott family, and which has been preserved and stands to-day exactly as it was when “Little Women” was written, thanks to the Alcott Memorial Committee. Every one of the famous characters which will appear on the screen in “Little Women” was passed upon by the surviving members of the Alcott family before a foot of film was taken. The players selected for the various roles met with unqualified approval also of several of the residents of Concord who knew Louisa M. Alcott and the little women of whom she wrote. The four “Little Women,” Meg, Jo, Beth and Amy. are portrayed respectively by Isabel Lamon, Dorothy Bernard, Lillian and Florence Flinn. Henry Hull is John Brooke and Conrad Nagel is Laurie. The picture is in six reels and is announced for release on a territorial basis. Questa voce è stata pubblicata in Cronologia 1918, Film e contrassegnata con Harley Knoles, Louisa M. Alcott, william a. brady. Contrassegna il permalink.